The decision to build Steven Moffat’s third season of Doctor Who around a series of done-in-one stories has been a bit of a mixed blessing. Asylum of the Daleks was suitably madcap Saturday tea-time telly, and A Town Called Mercy was an affectionate homage to Americana, but Dinosaurs on a Spaceship barely had room to breath, overloaded on cool moments with little room left for plotting. The Angels Take Manhattan suffers the most from this sense that it is being compacted. Watching the episode, it feels like Moffat is trying to cram too much story into a single forty-five minute episode. It makes the viewer long for the days when Russell T. Davies would gleefully run his episodes over the allocated forty-five minute slot. Here, Moffat’s big high-concept “timey wimey” ideas and his farewell to his two companions eating up so much of the run-time that the plot itself still feels like an afterthought, running on contrivance and coincidence rather than anything more substantial. 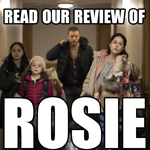 That doesn’t mean it isn’t an affective farewell to Rory and Amy, or that it doesn’t draw fantastic performances from its central quartet, but it does mean that The Angels Take Manhattan is never quite as sturdy as it should have been. To be fair, The Angels Take Manhattan was only ever going to be about one thing, and the script is remarkably up-front about it. It’s a fond swansong for Amelia Pond and Rory Williams as the Doctor’s companions. It’s a watershed moment for Moffat’s run as executive producer. In a way, this as big a moment for Moffat as Doomsday was for his predecessor. Both Amy and Rory were introduced in the first episode of his tenure as executive producer. With Amy serving over two seasons as a companion, Karen Gillen is officially the longest running companion since the relaunch of the show. She has outlast Billie Piper and any of the other supporting performers introduced in the years since Russell T. Davies resurrected the show. She has appeared in almost every episode with Matt Smith, and she’s certainly a huge part of the Eleventh Doctor’s character development, with the two playing off one another superbly. Davies went out of his way to emphasise just how important Rose Tyler was to the Doctor and the show as a whole, something he undermined by constantly bringing her back. In contrast, Moffat ensures that Amy feels like a vital part who the Eleventh Doctor is, but is quite clear that the show will continue on without her. The loss of Amy and Rory is devastating and moving and harrowing, but there’s a sense that this is an inevitable reality of life with the Doctor, and it doesn’t feel quite as manipulative as Doomsday did. 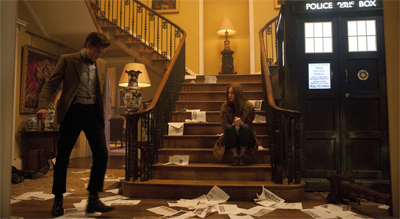 Karen Gillen and Matt Smith work wonderfully together. They have a delightful chemistry, with each enhancing the other’s performance – similar to the way that David Tennant and Catherine Tate brought out the best in one another; or Tom Baker and Elisabeth Sladen; or Frazer Hines and Patrick Troughton. Amy is very clearly an essential part of who the Eleventh Doctor is, and Moffat has been playing out this departure since the end of The God Complex. The Angels Take Manhattan is just the inevitable outcome. Indeed, part of what retroactively cooled me on Rose as a companion was the way that the show stressed her importance to the Tenth Doctor, to the point where he even got himself a “rebound” companion that the series never developed too much beyond the status of “not!Rose.” Dedicating an entire season television to mourning the departure of a character who has only been around for two seasons seemed a little excessive. 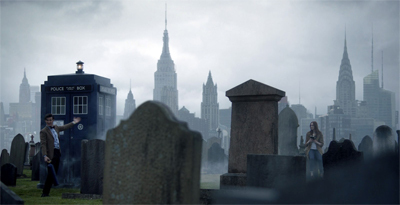 While Moffat allows the show to become a little over-angsty with the departure of the Ponds, he does mostly confine that to The Snowmen and The Bells of St. John. The Statue of… what’s the opposite of liberty? 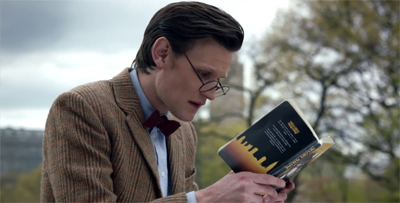 Still, The Angels Take Manhattan shrewdly downplays this element during the final scene, as the Doctor pleads with Amy to come with him into the TARDIS. “Pond, come along,” the Doctor earnestly begs, clutching her hand. In a nice touch, it’s quite clear that’s he’s lying about the Angel in order to get Amy to come with him. In Blink, the Tenth Doctor figured out that the same angel sends its victims back to a particular year; here, he tries to argue there’s no way to be sure. However, the show makes it clear that the Doctor doesn’t react well to any loss. It isn’t that Amy is that special, it’s that the Doctor is that emotionally dependent. River describes him as “an ageless god with the face of a twelve year old.” Even Amy concedes that he doesn’t handle his emotions well, advising him after River storms out, “I tell you what, stick to the science part.” While Moffat has rejected the idea that the Doctor is a flawed hero in any large sense, he has consistently suggested that the Doctor doesn’t tend to cope too well on the personal level. It actually gives the scene a greater resonance, if only because one imagines he’d react the same way to the potential loss of River. Perhaps Rory wouldn’t provoke the same response if he decided to follow Amy, but then Rory probably wouldn’t care too much about how the Doctor felt. The over-crowded episode means that The Angels Take Manhattan doesn’t actually get to dwell on the sense of loss experienced by the Doctor. Regardless, the scene is powerful stuff. There’s genuine desperation in Smith’s performance as the Doctor begs Amy not to abandon him, echoing in his breakdown when confronted for the first time with the possibility that Amy may not be coming back. It’s a testament to the talent of the actors involved that the final scene works as well as it does. It’s decidedly low key when compared to the departure of Rose or even Donna, but it hinges on the charisma of Smith and Gillen to carry it off. At the same time, The Angels Take Manhattan has its fair share of plotting problems, more of which seem to stem from the contrivance and convenience necessary to keep the plot moving. It seems a little weird that there just happens to be a Weeping Angel in that graveyard that nobody else noticed sneaking up on Rory. I could understand if there were a lot of statues in that graveyard, but it looks fairly modest. More than that, though, it seems unlikely that anybody surveying that graveyard at that point of time would fail to notice an Angel. Regardless of what they might believe – that the Angels are vanquished – the monsters were very clearly on their minds. It seems as if Moffat reached a certain page in his last draft of the script, and needed to shoehorn in the ending somehow. While it fits with the idea that the Angels would have hunted Rory to the ends of the universe, it feels rather convenient. “Where the hell did that come from?” River demands, and the audience are probably wondering the same thing. The episode is at least candid about these contrivances. When Amy asks why the TARDIS got bounced back to a particular graveyard, the Doctor responds, “They’re probably causally linked.” It’s like time-travel speak for “a wizard did it”, and a concession that the audience will just have to accept that link based on fate… because it’ll be important later. Besides it plays into the themes of the episode, and Moffat has made it clear that Doctor Who is a show that runs a lot stronger on theme than on science. The Angels Take Manhattan is packed to the brim with clever concepts and thematic elements, even if there’s a sense that the script is struggling to shape them into a cohesive whole. 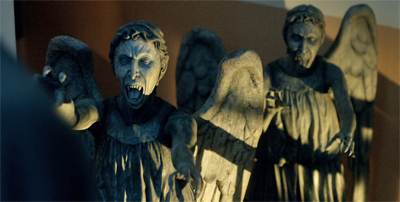 The whole plot involving the Weeping Angels seems rather jumbled and rushed, a collection of bullet-point high-concepts shoe-horned into forty minutes, each of which deserved more room. Like Time of the Angels, there’s a wealth of fascinating ideas about the Angels here, extrapolated logically from Blink. It just seems like there’s not enough room for them all. The notion of a “battery farm” for the Angels is particularly clever. After all, Blink made it clear that the angels feed off human potential, but also that human potential seems to be limitless; characters went on to live full and happy lives after the Angels fed on them. In some cases, these people probably had richer and more fulfilling lives than they might otherwise have had. After all, one of the recurring themes of Doctor Who is that human potential is limitless. As such, the idea of the hotel is quite ingenious. Keeping their food source close is a logical move, and it leads to some nice visuals. Particularly notable is the image of the three women who are the same woman seen in the windows of the hotel during the teaser. It’s a wonderfully effective visual that only really makes sense once you realise what’s going on. It also makes the Angels seem much more creepy and predatory. The idea of transforming the Statue of Liberty into a gigantic Weeping Angel is a bold move, even if I’m not sure it’s possible to make sense of it. The episode never explains why the rest of New York seems surprisingly calm about the Statue very clearly moving, and it seems hard to believe that the Statue of Liberty could be out of sight of everybody in the city for long enough to move that far. Grayle himself feels like an under-developed supporting character, feeling more like a plot device than a character in his own right. Since he has proven that it’s possible to capture (and torture!) 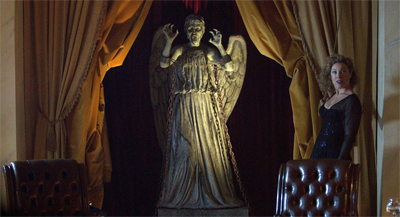 a Weeping Angel, one wonders how he has only one. If chaining it could hold the beast, surely he could just note the moving statues and chain them while keeping his eye on them. It would be more effective than waiting for the statues across the street to make their move. Grayle has some babies in the basement (with the creepy cherub laughter one of the more terrifying aspects of the episode), but it seems strange that he’d have only one large statue if capturing and holding it were so easy. He keeps it behind a curtain in the dark, presumably free to move – so he thinks he has it pretty secure. The whole thirties gangster sub-plot seems like an afterthought, and the New York setting is simply an excuse to see the Statue of Liberty become a monster. There’s nothing wrong with that, but it feels slightly surreal after the well-realised Americana of A Town Called Mercy. Still, the use of the Angels feels appropriate. All of this has been set up before, but the idea of the Angels who “let you live to death” is still a fantastic central idea, particularly the notion that they keep their captives hostage and continually feed on them like temporal vampires. Moffat also plays with the idea that the future and the present co-exist, that the future isn’t set in stone for time travellers until you know it – a surreal temporal observer effect. “Once we know what’s coming, it’s fixed,” the Doctor explains, which is a nice story-telling gimmick that adds another logical layer to the Doctor’s aversion to “spoilers.” The novel unfolding simultaneously “then” and “now” is an inspired idea. Given Moffat’s fondness for exploring Doctor Who as a story, having the Doctor and Amy trapped as characters within a book is a rather ingenious metafictional idea. “Only you could fancy someone in a book,” Rory observes – and it makes sense. It seems like Moffat subscribes to the idea teased in The Mind Robber that the Doctor is a refugee from the land of fiction. It’s also a fitting way to conclude the Doctor’s relationship with Amy, reaffirming that he is a storybook figure to her. The story opens with the trio enjoying a quiet afternoon in Central Park. “Read to me,” Amy asks. “I thought you didn’t like my reading aloud,” the Doctor responds. “Shut up, and read me a story,” she insists. It’s really a wonderful expression of the relationship between Amy and the Doctor. The Doctor doesn’t so much take her on a tour of time and space as he pulls her into stories. So it makes sense that this is the story that has already been written. The companion departure story is really the only certainty in Doctor Who, beyond the “Doctor regenerates” story. As soon as a supporting character joins the show, it is absolutely certain that there will come a point where they will have to leave. And nothing can be done to change that. It’s preordained, already written. Sure, the show can try to find a creative way to execute that story beat, and Doctor Who has had a lot of fun playing with an unconventional relationship between the Doctor and Amy, but it must eventually come to pass. So it makes sense that The Angels Take Manhattan is a story about characters trapped inside a story. “What’s Rory doing in a book?” Amy demands. “He went to get coffee and turned up in a book. How does that work?” He’s trapped by the confines of the narrative. His fate is already written. Sure, the particulars might change, but the core details remain the same. The companions must eventually reach a conclusion. The irony is that the Doctor himself is a character denied an ending. Companions get lives. Companions get endings. The Doctor will always travel, in one form or another. Even when the show went off the air, the character continued to travel in spin-off books and audio plays and a wealth of supplementary material. “He doesn’t like endings,” River explains, and it makes sense. He can never have one himself. Here, once again, we get a sense of Amy having to choose between the Doctor and Rory. The Doctor is a madcap adventurer who can take her anywhere, but Rory offers a life. At the end, Amy eventually decides to forsake the Doctor to be with Rory, but it’s a theme playing out across the rest of the episode, much like it has been playing out across Moffat’s tenure. The Doctor is a fantastic imaginary friend, but he’s not the real world. Rather pointedly, as the Doctor tries to figure out a way for Rory to evade his death, and to escape his inevitable ending, the Doctor seems to suggest that the only way that Rory could ever be completely free would be if Rory turned himself into another version of the Doctor. “Even if you got out, you’d have to keep running for the rest of your life,” the Doctor urges. “They would be chasing you for ever.” That sounds vaguely familiar, particularly when you consider Russell T. Davies’ suggestion that the Doctor doesn’t use his real name because of the people hunting him down. Inevitably, Rory and Amy decide to reject the option of running forever. Rory ultimately makes a risky sacrifice that the Doctor could never justify or condone, and Amy chooses to make that sacrifice with him. And then Amy decides to follow Rory into the past, never to see the Doctor again. Rory is a character who stands in contrast to the Doctor, ready to challenge the Doctor’s assertions and suggestions, and Moffat argues that he is the better choice for Amy to make – the choice that allows them both to have something resembling a life. Eventually, you have to leave your imaginary friend behind. Still, there remain some gender concerns. Amy and Rory work quite well as a couple. Darvill and Gillen play well off one another, and the dynamic is refreshingly original inside the TARDIS. However, their relationship does occasionally feel a bit too passive-aggressive for its own good. Rory seems just a little bit too bitter when Amy can’t tell him he’s wrong about his plan to commit suicide to cause a paradox. “The one time I need you to,” he mutters, as if frustrated that what he considers to be his wife’s constant nagging can’t be put to good use. It’s a small moment, but a jarring one. There are lots of other nice Moffat-esque touches to the script, and The Angels Take Manhattan plays quite well to the writer’s traditional Doctor Who strengths. Grayle’s observation that “these things are all over, but no one seems to notice” is a very Moffat line, a reminder that there’s something dangerous far closer than you’d like to think. That’s really the key some of Moffat’s best work, isn’t it? The innocuously terrifying, like shadows and statues and ticking clocks. There’s also some lovely character stuff, which underscores how well the trio work together, but also how well Moffat writes them. 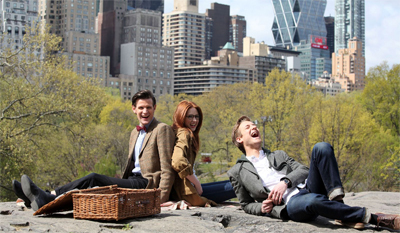 The introductory scene features the trio just hanging out in Central Park, joking and playing with one another. 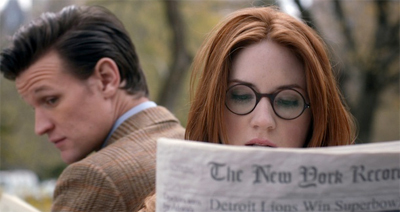 Suddenly, a remark from the Doctor make Amy’s reading glasses into a none-too-subtle reminder of her mortality. “I don’t like them,” he observes. “They make your eyes look all liney.” It’s raised, and it’s an uncomfortable moment. And then, like old friends, the awkwardness is instantly disarmed. “Can I have a go?” the Doctor innocently asks, as if hoping to live vicariously through his companion. The episode continues a lot of themes running through Moffat’s third season, with the show trumpeting a smaller-scale Doctor, one who can’t trade on his reputation like Russell T. Davies’ version of the character generally did. “I got too big,” the Doctor confesses to River at one point, and it seems like this year has been a concerted effort to lower his profile, as seen in Asylum of the Daleks. 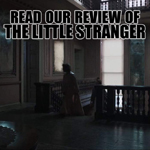 It’s a nice recurring story device, and I’m interested to see if it does cause the writers to approach certain ideas and plot points in a slightly novel way. The Power of Three confirms, after all, that UNIT are still very familiar with the hero. The Angels Take Manhattan does work as a farewell to Amy and Rory, and as a selection of bite-size Moffat-esque time travel high-concepts. Still, it feels a bit frustrating, as if all of that it being crammed into a container far too small. Given the nature of the TARDIS itself, that might sound strangely appropriate, but it is also a little unsatisfying. i agree largely with what you’ve said but felt less forgiving than you. It was all too rushed and trying too hard to be emotional. Last week’s was far better and it’s just a shame they couldn’t just tell him they wanted to be left alone to live their lives. I do hope this is the last we’ll see of melody as well!! I am quite forgiving, aren’t I? I thinkt here was a lot of good here, but it was just jammed in too much and suffered from trying to condense it to a forty-five minute episode. Had it been a two-part adventure, it might have been the best departure sicne The Parting of the Ways, but it suffers because there’s not enough room to do each and every idea justice. I’m a new Dr. Who fan and am generally enjoying the show, but this episode to me features all the problems with the Moffat era. Davies might have been overly sentimental, but I always felt like there was at least an emotional payoff. Rory goes out like a punk in this episode. We don’t get any emotional payoff for over 2 years with the character. He doesn’t die saving the world or anybody in particular, just caught in some time loop. Amy at least gets to say goodbye to the Doctor, but it still feels underwhelming that her fate is to go live in a hotel forever with Rory as the victims of the Angels. I like Amy and Rory, but what was their character arc over the past few seasons? We’ve known that they love each other and have a healthy marriage (for the most part), so what did this departure show us about them that we didn’t know. When Rose and Donna departed, it was an important moment as they finally took the initiative and realized an inner strength. They grew over the course of the season. 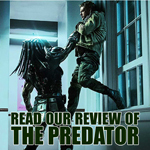 Not every character needs to go out saving the world, but it just seemed very contrived. Using the book as a metanarrative for how characters in a story can’t change their fate was clever, but I think actually undermined the emotional impact here. This should have been a show about some sort of payoff for the longest serving companion on the nuWho, not a reminder that they’re just characters in a story whose lives don’t really matter. I’m glad there was at least a storyboard for a final meeting between the Doctor and Brian Williams, but that seems way too an important a part of the story to leave offscreen. Brian had been so concerned with keeping Rory safe, and then gives him his blessing to go with the Doctor. So what does the Doctor say to him? Some of the best moments of the Davies era were when the Doctor has to interact with the companion’s family members, particularly Wilfred. It just seems wrong for the show to introduce Brian, do a good job getting the audience to invest in him, then ignore him when it’s most important. Also, Moffat seems to trip over himself on the “timey whimey” stuff. Characters’ destinies can’t be altered when the read it in a book, but apparently reading it on a gravestone doesn’t have the same effect because Amy Pond clearly sees a gravestone without her name on it, but then she travels back in time to die with Rory and her name gets added. The show really ought to decide at some point if characters can change the past or not, but having such a contradiction in the episode felt really lazy. I think you said it best in one of your reviews: the Davies era had more heart, the Moffat era has more brains. I don’t think one is inherently better than the other overall, but I think an episode featuring a companion’s departure really needs a good dose of heart. Thanks Dom. I would agree with that. 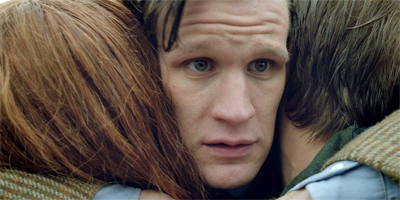 The Davies era is more rooted in emotional storytelling than the Moffat era. In particular, I think that Moffat’s biggest misstep as showrunner was a failure to offer sufficient emotional depth to the whole Amy/Rory/Melodi story in the second half of the sixth season. Although it’s a very clever story from a structural or thematic perspective, neither Rory nor Amy feel like real people in that stretch of the season. On the other hand, there are moments where the Moffat era can be smart and emotional (Heaven Sent is a case in point), just as there were points where the Davies era could be clever and emotional (The Parting of the Ways, Midnight). But I think that division is quite effective. I have a personal preference for the Moffat era, but I don’t think I could convincingly argue that it’s better television. Both Davies and Moffat have their own strengths and weaknesses, and I think the show is stronger for having had both of them as showrunners. Too bad you can’t merge the two into one show runner 😉 I actually think Moffat got better with the 12th Doctor. I’m quite enjoying Season 8 so far. It has more emotion and the characters feel more real It makes me wonder if the problems I had with Seasons 5-7 were Moffat so much as the combination of Matthew Smith/Amy Pond. I adore S8. It’s right up there with S1, S4, S5 for me. I take you’re catching up and haven’t started S9 then? 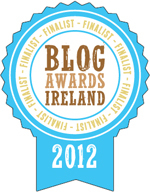 I hope I haven’t inadvertantly spoilt anything for you. 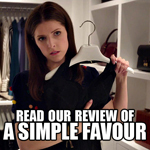 No, your reviews are great about incorporating future material without spoiling. 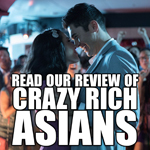 I love your reviews in general and am reading a few of them just to get a better understanding of the show since I’m fairly new and just binge-watching for the first time. 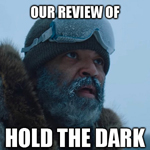 I am a big sci-fi fan, but I wanted to avoid the mistake of judging or interpreting Doctor Who compared to the standard and expectations I’d developed for say Star Trek for the past 20 years. 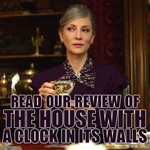 I read your essay “Is Doctor Who Too British for Americans?” and thought it’d be particularly useful to get a non-American perspective on the show.